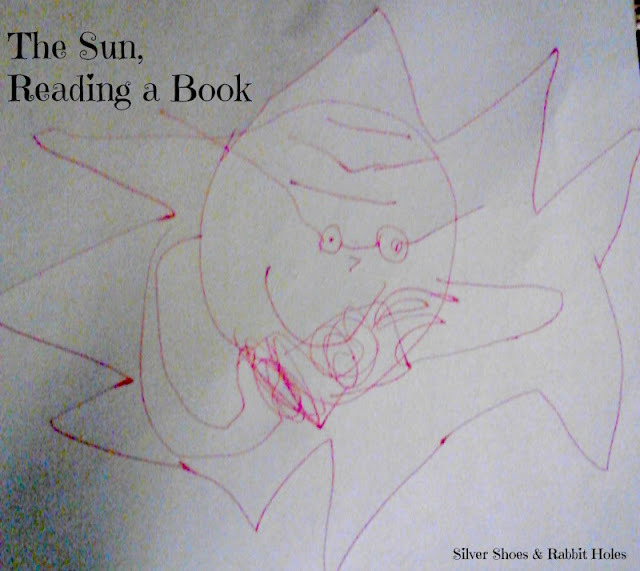 Little Sis drew this picture of the sun reading a book. Even great big balls of gas read in our house! I decided to empty some pictures off of my phone. Instagram is a little addictive. 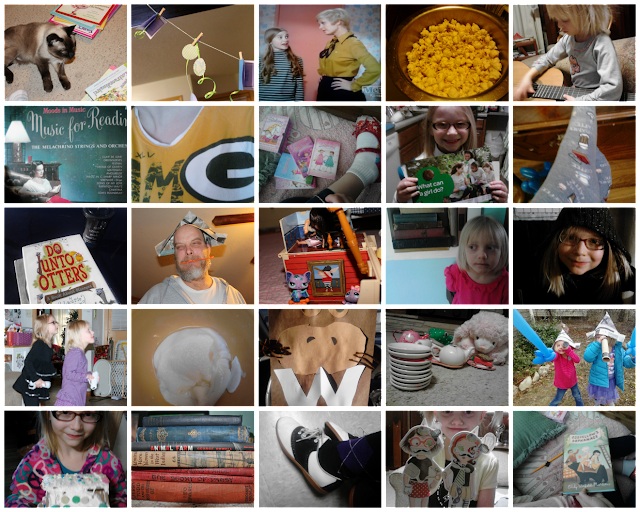 Anyhoo, here is a collage of some of the random things I photographed just this month with my not-so-smart little smart phone. I start a new play next week, so I'll be working on memorizing lines soon. And Big Sis starts selling Girl Scout Cookies at the beginning of February, so we will be pretty busy! I feel I need to document all our downtime while we have it, I guess. Top Row: 1. Katie, surrounded by books; 2. Book garland (inspired by this) for an upcoming baby shower; 3. The girls are loving The Brady Bunch on Me-TV; 4. Is it bad that I eat stove-popped popcorn every freakin' night? ; 5. Little Sis and her giant guitar. Second Row: 1. Music for Reading (I love this album cover); 2. I wore my Green Bay shirt two Saturdays in a row. Alas, the good luck only worked the first Saturday; 3. Little Sis's foot and the Pinkalicious Teeny Tiny Pinky Library; 4. Big Sis will start selling Girl Scout Cookies again on February 2nd! ; 5. my coffee socks. Third Row: 1. Do Unto Otters (I read it to Big Sis's class yesterday); 2. Pirate Daddy; 3. Pirate Olivia and some Littlest Pet Shop stowaways; 4. Little Sis up to something; 5. Big Sis looking sweet. Fourth Row: 1. Playing Just Dance 4; 2. I poached an egg!!!! ; 3. a walrus made in pre-K; 4. Froggy and Lamby had a tea party; 5. pirate buddies!. Bottom Row: 1. Saying goodbye to a gingerbread house; 2. pretty books; 3. my beloved saddle shoes; 4. Little Sis makes Ivy & Bean look CRAZY!!! ; 5. Oddfellow's Orphanage. Fun!! And great picture, Little Sis! And what is the play this time around? This one is an original script based on a book about the women's movement in Wichita during the '70s and '80s. Lots of newness for me here: new-to-me theatre (a paying theatre, no less! ), new-to-me director, obviously a new script. Lots of old friends in the cast, though. You know, all I do is mostly community theatre-type stuff, but it keeps me busy, and lets the girls see I do have a life outside of them. Especially now that I'm home full-time otherwise... I love my theatre peeps, too! We get a channel called Me-TV through the converter box. On Sunday mornings, between 10 and noon CST, they have what is called "The Brady Brunch." That's where the girls were introduced to the Bradys. CBS.com runs episodes for free with VERY LOUD COMMERCIALS, and sometimes, Big Sis watches there. Not every episode is available there, though. I wanted to show them the "Jan's Aunt Jenny" episode; I was disappointed. There's a DVD boxed set, and the box is covered with green shag!